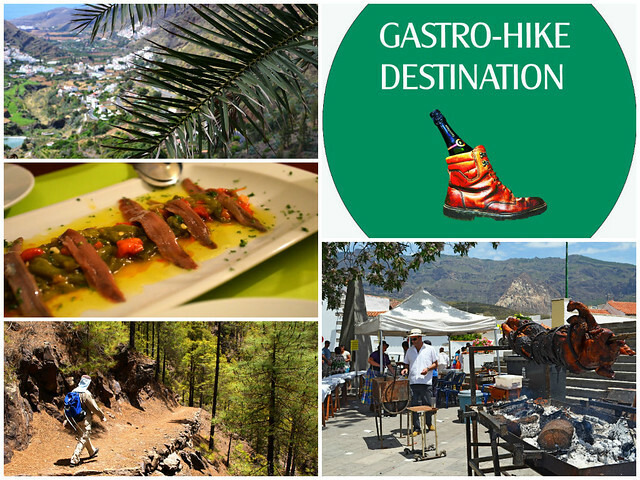 Saying Gran Canaria is a surprising gastro-hike destination is a bit misleading. It’s not a surprise to us and those who know Gran Canaria beyond its resorts, but it might have others raising their eyebrows. The big boys of the Canary Islands (Gran Canaria and Tenerife) get a one-dimensional, bum deal as far as publicity can be concerned. Over the last couple of years we’ve spent quite a bit of time walking on Gran Canaria. On one trip we walked from the hills above the south coast right to the water’s edge on the north. 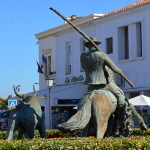 That sort of walking expedition gives you a generous serving of the island’s scenery, rural life and gastronomy. The scenery shifts and changes constantly; from sprawling canyons to vertigo inducing ravines to misty, atmospheric forests. For a relatively small island there’s a lot of big country to cast admiring eyes over. In villages and rural houses we tucked into hearty and fresh Canarian hill food. Much of it wasn’t really any different from any other Canary Island. However, there were plenty of chefs along the way who clearly liked to be a bit more creative with their food. It’s because of them that Gran Canaria is not only an exceptional walking destination, it’s a location that should satisfy the tastebuds of anyone who likes some adventure on their plate as well as in the great outdoors. Good walking scenery should stop you in your tracks. Routes on Gran Canaria regularly had us stepping on the metaphorical brakes to stand, hands on hips, soaking up expansive vistas of rocky canyons and intriguing plateaus. There is a distinctly wild western look to some parts of Gran Canaria, especially around Tejeda. In others, crossing from Tejeda to Fontanales for example, the scene can shift from being as dramatic as the Scottish Highlands in appearance, even with soggy sheep, to enchanted forests that could easily be home to flighty faeries. 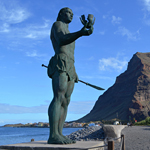 The scarred ravines around Agaete and Tamadaba exude an air of times long gone, assisted by the fact that the area is home to burial grounds of the Canarii, the island’s original inhabitants, as well as a network of caves where the Canarii once lived. This cave dwelling habit hasn’t entirely died out and there are still some troglodyte communities around. 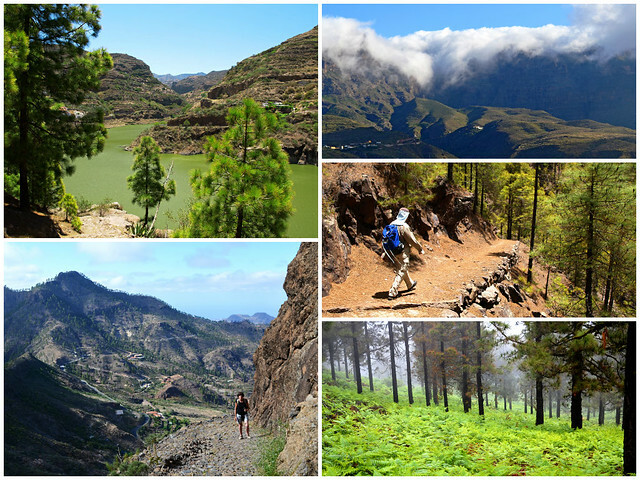 Walking trails lead to the summits of Gran Canaria’s highest peaks, where atmospheric plateaus seem Lost World-ish, as well as to the bottom of volcanic cones. The landscape is almost constantly transforming; a shape-changing world that keeps you alert and interested. One thing that remained constant during our treks through Gran Canaria’s rural world was the friendliness and generosity of the people we encountered. During every visit we’ve had an experience that illustrated this. 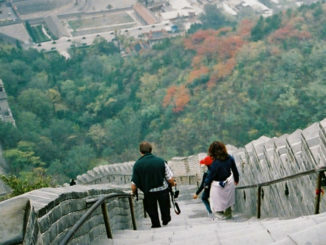 When you’re walking in unfamiliar surroundings, the friendship of strangers means an awful lot. When we walk on Gran Canaria, we come away uplifted, as though our spirits have been soaring with the birds above the island’s extraordinary landscapes. When the first sight that greets you when you trundle into a picturesque hill town is a crispy looking pig on a spit, you know that you’re going to be faced with some interesting gastronomy. 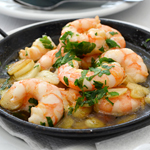 For anyone unfamiliar with Canarian cuisine, there are plenty of interesting but simple dishes to try. 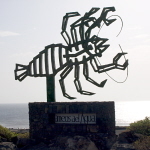 These can range from savoury local cheeses and salty sardines to chunky moray eels, fried goat and saucy rabbit. In many places, even in the heart of rural Gran Canaria, there are local chefs who break out from the rigid conventions of Canarian cuisine to mix things up a bit. There’s the artistic chef at Casa el Caminero in Tejeda who is as creative with his food as he is on canvas, combining local honey rum with bananas to make a drunken dessert. Then there’s Pepe at El Mondalón, marrying almogrote from La Gomera with papas arrugadas (Canarian wrinkled potatoes) to create something so good you could cry. Fermín at La Poshada in Fontanales is a perfectionist with his culinary works but who can also make the meanest bocadillo you’ll sink your teeth into. Victor at La Finca de la Laja in Agaete isn’t a chef but he and his family produce some of the most quaffable wines we’ve downed on Gran Canaria as well as running the most northerly coffee plantation in the world. In every town there seems to be locals with a creative, culinary bent. Even in a traditional restaurant in Tejeda, the olive oil accompanying chunky bread comes with a funky design, painted with balsamic vinegar. At La Botica in tiny Agaete, the tapas is imaginative and the wine irresistible. 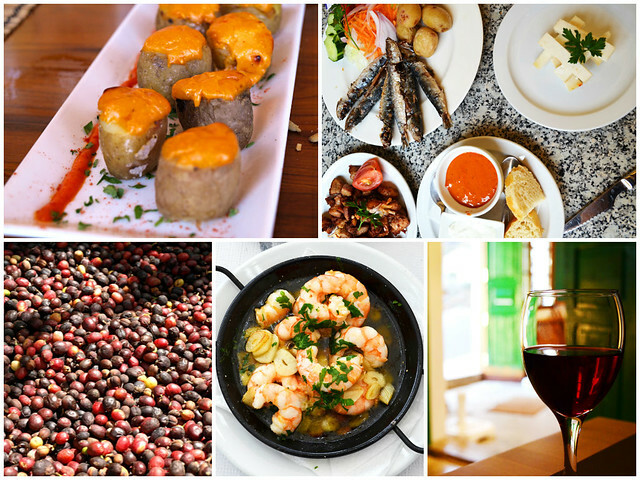 The bottom line is that the gastronomy on Gran Canaria can be as diverse as the countryside… and that’s without mentioning the restaurants and tapas bars in Las Palmas de Gran Canaria. To put it another way, Gran Canaria can provide a feast for the eyes and the stomach and what’s more it can do so every single month of the year.